Beam: 6" x 25 lbs. Barreto is pleased to announce the addition of the 920LS Log Splitter to its innovative product line. The 920LS offers a 20-ton ram and operates both vertically and horizontally. Capable of splitting logs up to 24", the 920LS is the perfect addition to any rental fleet. Like all Barreto equipment, our new log splitter is powder coat finished for durability. The beam is well balanced for ease of positioning from horizontal to vertical. Spring-loaded lock bars bolt the log splitter into position. It also features an optional two hand valve control for safer operation. Rubber vibration isolators are installed on the engine mount. The main beam also rests on rubber isolators. Nylon bushings are installed at all pivot points to reduce wear and limit vibration. The hydraulic system features an intake screen and protected filter. An easy to read sight glass offers quick reference for fluid levels. 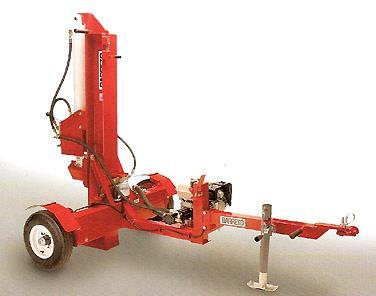 An easy-to-use, adjustable Log Cradle comes standard with the Barreto Log Splitter. The engine is mounted on rubber isolators to dampen vibration. This reduces wear to linkages, pins and other loose components. Overall noise associated with operation is also decreased. Optional 2-hand control system reduces the risk of injury. Operator must activate both levers before ram will extend. Adjustable Log Cradle holds log in place while operating ram. This feature is Standard along with our Two-Hand Control system. * Please call us with any questions about our log splitter towable rentals in Fallbrook CA, Temecula, Camp Pendleton, Bonsall, Escondido, Twentynine Palms and Northern San Diego County.